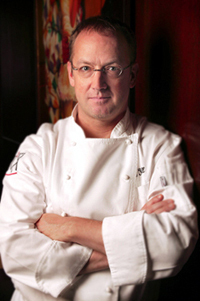 As chef of Pizzeria Picco in Larkspur, Restaurant Picco in Larkspur and Bix in San Francisco, Chef Bruce Hill has a flair for creating stylish Italian and New American food. He also has a thing for massaging fruit. Before you raise your eyebrows too high at that, just know that it involves the ancient and quite labor-intensive Japanese tradition of preserving persimmons. Hill has been making the dried persimmons, known as hoshigaki, for the past four years, ever since he was inspired to give it a try by the lovely sight of all the bright orange persimmons at his local farmers market. He doesn’t use the hoshigaki at his restaurants or sell them. He just makes them for fun to give to family and friends. And when he asked me if I would like to try some, I jumped at the chance. Hill employs the traditional method of making them, which requires that the persimmons be peeled by hand, then hung by string for several weeks. During that time, he gives them regular massages to help break up the flesh and to help maintain their uniform shape. The rub-downs also help smooth the exterior to retard mold. After about six weeks of this pampering, a white powdery bloom naturally appears on the fruit, signaling that they’re ready to be enjoyed. He sent me two kinds of hoshigaki, each made of the Hachiya variety of persimmon, so that I could get an idea of the transformation process. 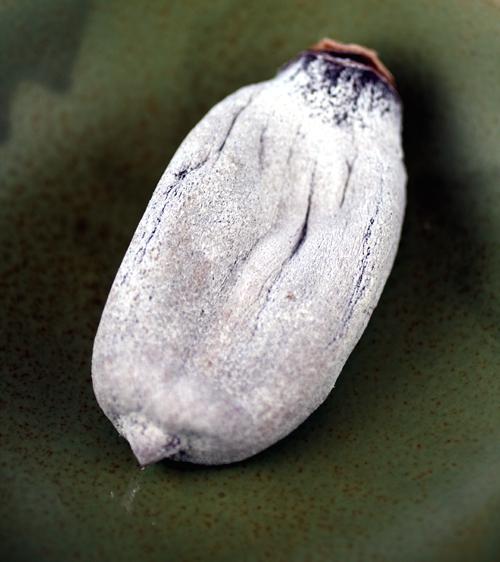 The first hoshigaki, from Blossom Bluff Orchards, were the hue of yam puree. Still vivid orange, they had been started just three weeks ago. 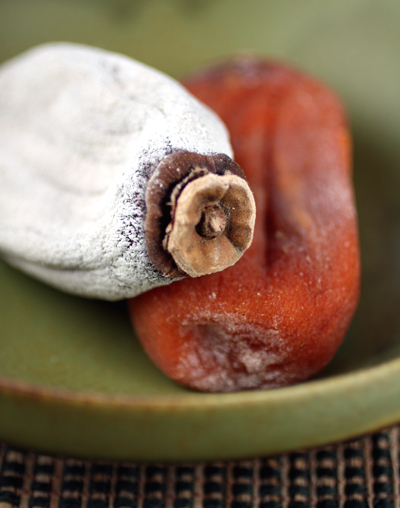 The second, made from persimmons from Hamada Farms, had the characteristic frosted look, having been started more than two weeks prior to the other batch. The difference in appearance was indeed striking. So were the textures. The orange ones were moister and plumper; the white ones were denser and meatier. The flavors of each were similar — almost sweet potato-like with a subtle floral quality and a hint of warm baking spices. 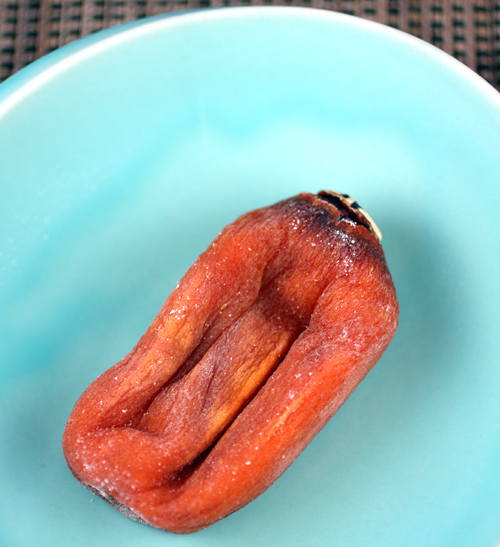 If you’d like to try a taste of hoshigaki, you can find them at this time of year at Japanese markets, such as Nijiya. With all the labor involved, they don’t come cheap. Expect to pay about a dollar for each one. Hill’s hoshigaki were huge in size compared to the ones I’ve seen in stores. They were beautiful to behold. What a treat to enjoy an unforgettable gift made with such care and passion. ooh, my parents love these. I just got them a bag from the we love jam folks, that was rather expensive @$18/4 pcs. But my dad said they were the best he had ever eaten… those Japanese love to massage their food! Are these enjoyed like other dried fruit? Any fermented flavor to them? And do you wipe off the powdery mold before eating? Very cool. Sophia: Yes, you eat them just like you would any other dried fruit. And you eat the powdery bloom — you don’t wipe or rinse it off. No fermented flavor to them, either. I hope you get a chance to try them. They’re really wonderful. I love hoshigaki, and neglected to order some from We Love Jam this year. I’ll have to see if they have any at Marina Foods. Sophia: they are often enjoyed as a tea sweet in Japan, They complement green tea really well. What an interesting post for a great food technique! My husband’s boss just gave us a box of these for Christmas. Can’t wait to try them! What an interesting way to preserve persimmons. And what a special gift to receive! Amazing! I’ve never heard of this, but it looks very good! OHMIGOSH. My FAVORITE! Yuuum! The Korean markets sell these by the lb, but I suppose they aren’t the quality of these! Have a great rest of the holidays!!! The white powder is different types of sugars, usually glucose and fructose. Some people believe mannitol and other sugars/sugar alcohols are present, or that they may be byproducts of bacterial processes. CT: Thanks for the great explanation of the white powdery bloom. I love the look of it — like snow dusted delicately on the fruit. Holy Moly, Carolyn! My family looks for these every winter at our local Japanese markets. They’re not cheap, and the best ones have that white sweet powder on the outside. Truly a labor of love to make! We go crazy for these things, especially my parents’ generation. Did Chef Hill happen to mention more details on how he makes these? We were under the impression that the bay area is much too damp to dry the hoshigaki successfully – that you need a super dry climate like Japan or Fresno. Here in Cupertino we are blessed with a prolific kaki tree and would love to turn some into hoshigaki but could not figure out where to hang them to dry. In Japan they are hung under the eaves of the house, but around here we’re sure they’d just turn to mold. I use a oscillating fan to keep the persimmons from becoming moldy. The fan also keeps the fruit flies away.